In 2009 The Temper Trap made big waves with their hit single “Sweet Disposition”, but beyond that single they have continued to make great music and tour the world, (despite recently losing their lead guitarist Lorenzo Sillitto), most recently at Dot to Dot Festival where I got the chance to catch up with drummer Toby Dundas and Bassist Jonathon Aherne. Your upcoming album “Thick as Thieves”, is your first without Lorenzo. 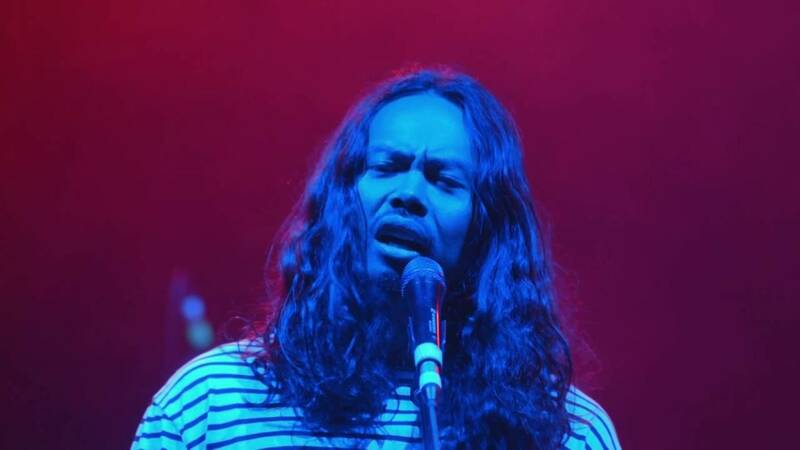 How have you managed to retain the “Temper Trap sound” without him? Jonathon: I think we’ve always understood the DNA of what makes The Temper Trap, with Lorenzo as well but also between the four remaining members you know, we all play guitar, kind of badly [laughs]. It certainly was not nice losing him but I feel like that particular thing hasn’t proven to be an issue. Toby: [Interrupting me, the sod] have you checked out his research? Australian ‘cuz: I just sort of let him do what he did. So anyway, coming from Melbourne, what do you think of or know about the music scene in Australia? Toby: Well the music scene in Australia is really good you know, even when we were back in Melbourne in like 2004. Bands like Tame Impala show it really bats above its average in terms of cool bands that come out of it. What will the new album be about, any overarching themes? Toby: I don’t know if there are any overarching themes but lyrically, to me, it feels a lot more hopeful and uplifting than the last two albums. The last one in particular was sort of like a breakup album in a lot of ways. It had more of a melancholy vibe to it, whereas the energy and spirit of this one feel more up-tempo and has much more of a rawness to it I think. Do you think that has anything to do with the instrumentation of it, being more guitar based? Toby: Yeah. I mean we definitely talked about it being more guitar based when we were starting off, using less synth. Obviously the first album is pretty guitar based as well so I think that’s a fair comment yeah. How are you approaching the live shows without Lorenzo, are you doing anything different? Jonathon: Yeah Dougie (lead singer) kind of had the freedom to not play guitar, unlike the last two albums were has a lot more work on his plate. Joseph as well, who used to be more keyboard based, has taken on all of Lorenzo’s things. We’re a bit in two minds about it, if it’s too stripped back or if it has more energy and is rawer but we think it’s working live so we’re happy. You’ve toured all over the world now, what would you say was your biggest culture shock going abroad? Jonathon: We toured in Japan and their culture is so rich and so defined, and that was a really good culture shock. Even their mannerisms when they’re at a gig, they’ll clap, and then it will all go quiet. They won’t talk either. Jonathon: You could hear a mouse fart. Toby: Then as soon as the next song starts they get back into it but there’s that weird polite pause before every track. Have you had the chance to listen to any of the bands on the bill for Dot to Dot? Any favourites? Jonathon: Not really, but this was one of the first festivals we played when we first came to the UK. So this was quite the monumental moment for us coming here in 2009 and being a part of this. It’s cool. I was thinking like we’re too old to be doing this now [laughs]. So I ask this to all the bands I interview, if The Temper Trap was a cocktail, what would it be? Toby: Probably a pretty healthy one. Jonathon: [laughs] yeah a bit fizzy as well. I actually invented a cocktail the other day, a “dreamy rainbow kingdom” so maybe that’s what I’ll name our cocktail. I don’t know what’s in it though, I mainly focused on the visuals. It actually wasn’t very good [laughs]. Toby: Well seeing as we’re the old guys at this festival now, let’s call ourselves an old-fashioned. Do you like Sweet Disposition? Jonathon: [laughs] Yeah, I mean none of us have really struggled with liking that song, or even playing it live because it takes on a life of its own. Everyone is in that moment with you and that’s what you want to do as a performer, to connect with your audience. That song is an instant connection. When can we see you guys in Lancaster? Toby: Well definitely later this year we’re doing a big UK tour. You should start a petition at the Uni, you’ll only need like 10 or 15 signatures and we’ll probably come.